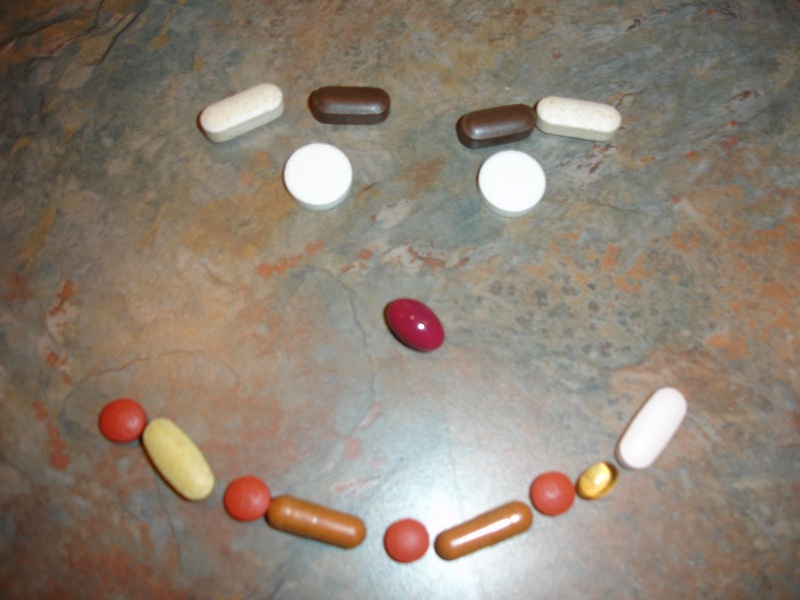 I Pop A Lot Of Pills! It seems like I have to take a lot of supplements to keep this body working. 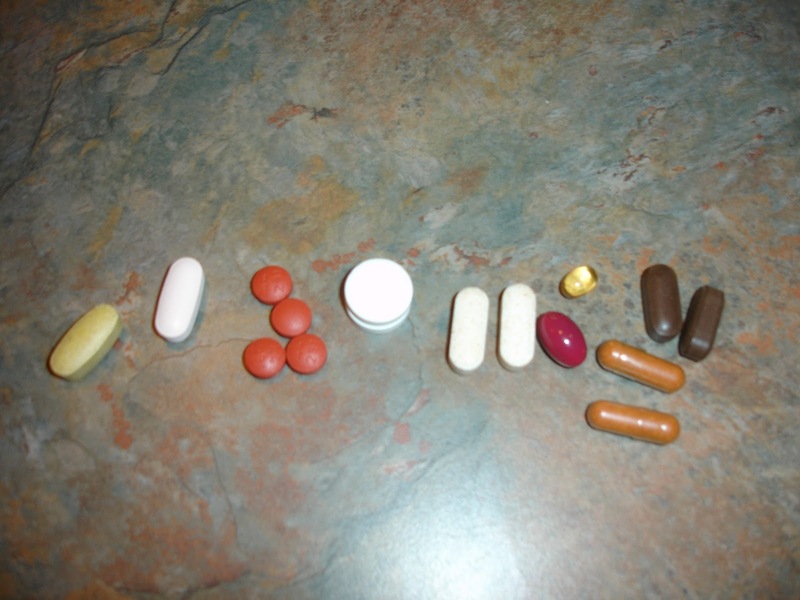 From Left to Right: Multivitamin – because I like to cover all my basis, Calcium – because I’m getting old and apparently my bones are going to start getting holes in them any day, Ibuprofen – temporary and due to the foot, Acidophiles – it promotes good GI health and helps fight off yeast – I think this is why I have not had any athletes foot issues, Vitamin C – because I don’t want to get sick, Cranberry Pill (the red one) – all I have to do is type the words bubble bath and I get a UTI and this helps prevent that, Vitamin D (the small one above the red one) – because we don’t get enough sun around here, Glucosamine (the two dark ones) – to help out my joints that are taking a pounding, and Recovery e21 (the two mud colored ones below the two dark ones) – electrolyte replacement that helps with muscle cramps, and can I say that it totally taste like fish scales and sea animal waste that was scrapped off the bottom of the ocean and crammed into a capsule? It’s nasty stuff. Kind of a wicked looking smiley face no? 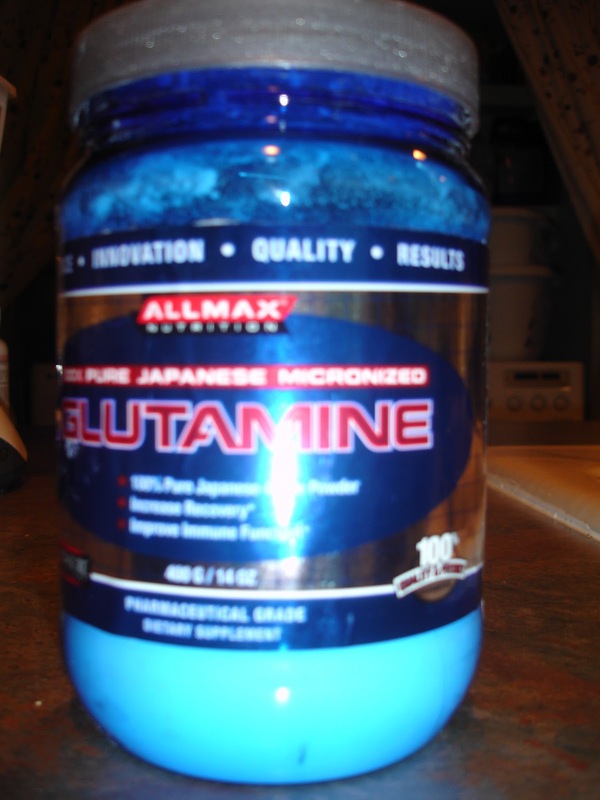 And last Glutamine – it’s sort of a magic powder that helps with muscle repair, fight colds etc. All in all it sure seems like that with every birthday a new something is added that I have to take with food, but not OJ. Some concern has been expressed about what, if anything, I will be taking the morning of my race as far as pain killers. After going to the Dr. yesterday it was made clear that the only acceptable thing to take is Tylenol. So that is what I will be doing. I tested out the new inserts today and my foot felt pretty darn good. Granted I tested them out in fitness class running up and down the gym, so who knows how it will feel on pavement. But you know what I decided this morning I’m done thinking about it, and done test running only to verify yet again that yep it hurts. It’s going to be what it’s going to be, and I will finish or I won’t, thinking and stressing and test running this late in the game is not going to change the outcome on Sunday. So I decided that I would rather go to class, take it easy (only did half the reps and effort), see my friends that I have been missing, and enjoy a workout for a change. From here on out the foot is a non-issue, done talking about it, done thinking about it. I’m not stressed, I am ready and I know what I need to do. I’m totally excited and can’t wait to get out on the course about 5 to 6 miles in and am settled into my pace and have all the jitters worked out. It’s going to be a great day! On a side note, my friend Elya that ran the first half of my two longest training runs with me, broke her ankle yesterday. I feel horrible for her. She was running the last leg of the Marathon with her Relay Team on Sunday and now obviously she can’t do that. I was so looking forward to seeing her Sunday.